I managed to cross the Pecos River in northern New Mexico -- just barely, even though I had on my boots. Not so lucky on the trip back. I caught my foot on a boulder and fell face-first into the Pecos. I was fortunate not to have broken my ankle. Those boots kept my foot in place, but my fishing trip was over for the day. I was soaking wet and miserable. Wading boots -- don't leave home without them!! Your boots are an important piece of equipment when fly fishing. They should be strong and durable, and provide you with good traction on slippery river bottoms. They can keep you safer than wearing regular athletic shoes. You don't want to end your fishing trip early to head into the emergency room to fix your ankle. Boots are made to keep you safe and comfortable while walking on wet, slippery rocks in and out of the river. What makes these shoes different is that most have soles made of felt. The felt gives the boots a good grip on wet and slippery rocks. Felt bends to the contour of the rocks much better than standard soles. 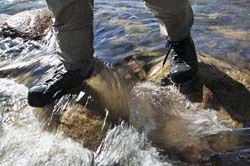 Don't use your wading shoes for hiking or walking… this wears down the felt much more quickly. While the felt can be replaced, it can be a hassle. 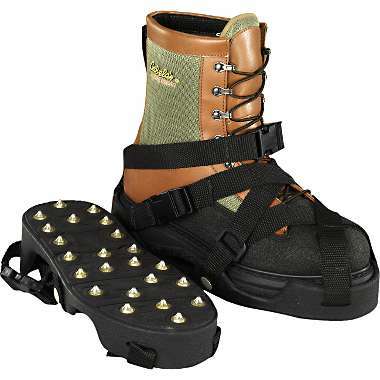 If you need even more traction, there are river talons and cleats that can attach to your boots to provide more stability. When shopping for wading shoes, make sure you get good ankle support. Make sure you get a size larger than your normal shoes unless the shoes are labeled telling you to use the same size. This is to provide enough room for your waders. For around $60, you can get Premium Christmas Island Wading Boots. They are heavy duty, comfortable and breathable. The uppers are made of Airprene, while the bottoms are crafted from nonslip, hard rubber. The cuff is snug to keep out debris and grit, and the boots zip up on the side. For $70, you can get the Pack and Travel II Wading Shoe. These shoes are lightweight and pack down into a backpack easily. The collar is made of neoprene to fit snugly to filter out debris. The material dries quickly when you get out of the water. Split lace paneling helps give you more flexibility. In mid-prices, you can get Clearwater Wading Shoes with studded soles for $80. With this pair, you want to order your normal shoe size. Lightweight and comfortable, this shoe offers great support and ankle protection. A foam padded insole helps keep you comfortable. The soles are made of felt and feature studs to give you additional traction. Another shoe at this price is the Salomon Techamphibian Wet-Wading Shoe. Built like athletic shoes, this model is perfect for warm-weather fishing. A rubber sole offers good traction and the mesh uppers dry quickly and keep debris out. 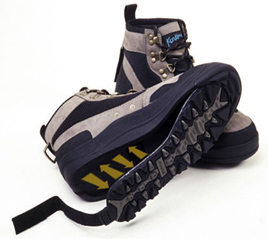 A friction-toggle system offers you a secure fit without laces. For $90, you can get the Wet Wading Shoe. This is another shoe designed for hot weather. Modeled after a hiking boot, the outer shell is lightweight and durable. It also dries fast. A removable neoprene bootie with elastic side panels helps seal out sand and grit. Alternatively, the bootie can be removed and used as a stockingfoot wader. For the upper price level, you can start with the Ultra-Light Wading Shoe at $98. Feather light and quick drying, this shoe is perfect to take along traveling to your favorite fishing holes. It is available in studded soles or plain felt. Featuring tough nylon and Nubuck fabric, it is durable enough for every day. A natural rubber layer protects the toe of the boot. Order this boot in your normal shoe size. For $119, you can try the Easy-On Battenkill Brogue. This durable studded wading boot is easy to slip on, zip and get to fishing. Adjust the laces the first time you wear them and lock them in place. After that, all you need to do is slip them on and off. Great for cold weather. Felt soles come studded or plain. These boots are modeled after hunting boots and offer good ankle protection. It resists rot, mildew and sun damage. Finally, at $129, you can take a look at Henry's Fork II Premium Wading Shoe. One of the best fly fishing boots out there, this shoe offers a flow-through tongue, foot bed and arch constructions to keep out debris and let water drain out extremely fast. 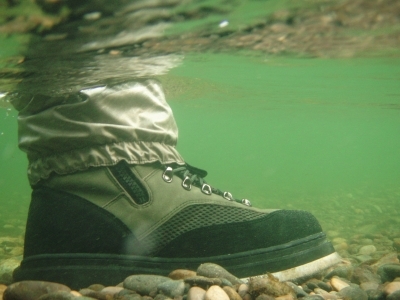 A speed-lace system helps you change into your wading boots quickly and easily. A unique honeycomb insole filters out fine sand to protect the soles from abrasion. Order your normal shoe size with this model. Also, check out Korkers. They have an interchangeable system second to none.